September 18, 1847 letter from the City of Bangor to the Gentlemen Overseers of the Poor of the Town of Athens, Maine, regarding the family of Loring Plummer who continued to be in need of assistance. The letter was signed by John McDonald, representing the Overseers of the Poor of the City of Bangor, Maine. 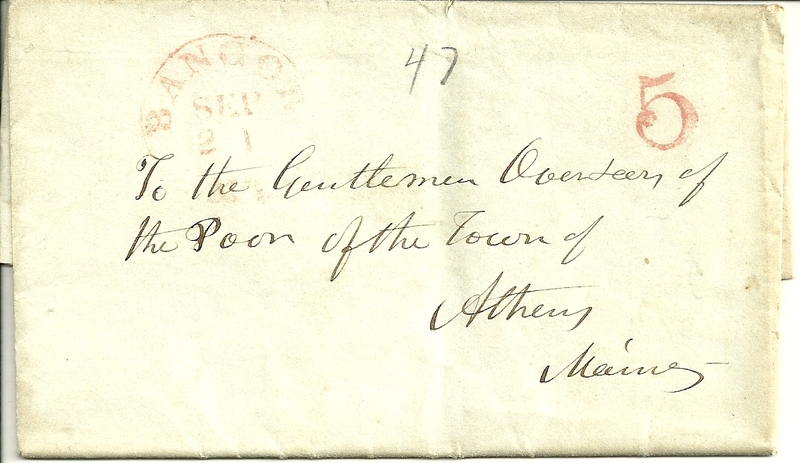 This letter was the subject of a short article by a Massachusetts author in the May 2010 issue of the Maine Genealogist. There was no image accompanying it. When I first read the article back then, I had no idea that it was a letter I had purchased myself on eBay in 2009, recently come to light. Loring married Sarah Sally Grant, who was born 25 October 1816, presumably in the Somerset County area. 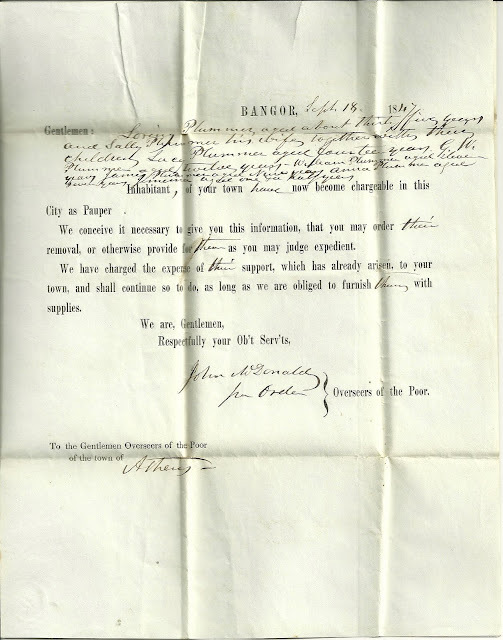 I wonder what desperate circumstances drove the family to Bangor in the late summer of 1847. Lucy Plummer, born about 1833; in the 1850 Census of Dover, Maine, Lucy was living with her paternal uncle Horace Plummer and family. G. W. Plummer, born about 1835. He was possibly George Washington Plummer. William Plummer, born about 1836. Loring and Sally Plummer eventually moved to Dover, Maine, in Piscataquis County. I hope their lives took a better turn. Sally (Grant) Plummer died 8 September 1875. Loring married three more times in his old age before dying 18 November 1888.